In parts 1 and 2, we unveiled the top draining apps on Android across the board: the ones that ruin your battery life, hog up your storage or monthly data volume, and the ones that do it all at once. By using data anonymously collected from millions of our users, we also learned which phones and apps are the most popular globally. 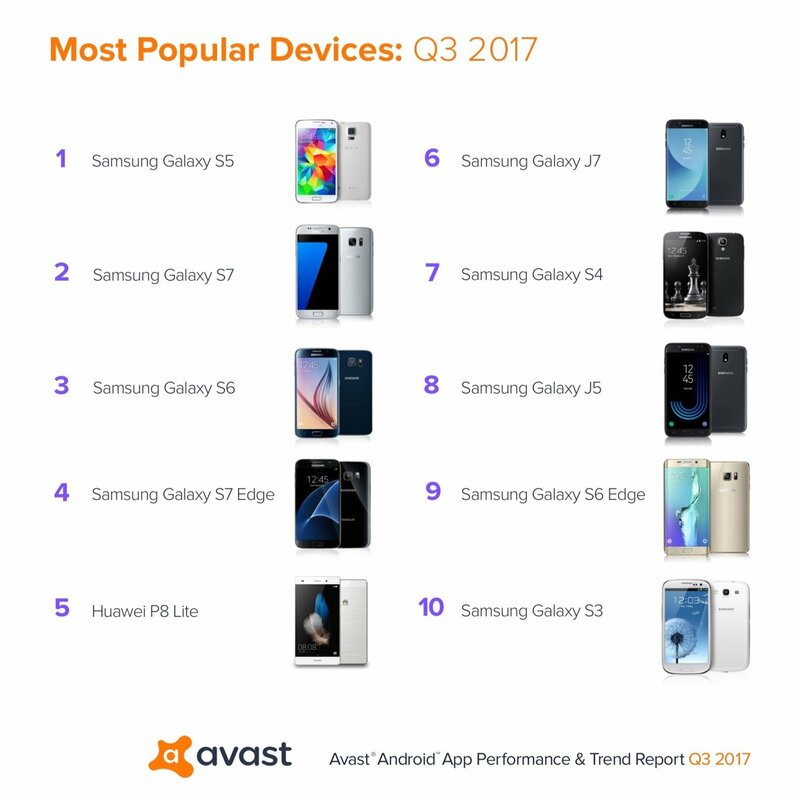 Between July and September 2017, Avast analyzed data gathered from an aggregated and anonymous sample of Avast Android mobile app users. We learned that the most popular installed app is — no surprise — Facebook, followed by WhatsApp and Google Chrome. Microsoft got out of the phone hardware business (“Windows Phone”) and is focusing more on delivering apps on Android and iOS. In Q3, three of its apps — Skype (6), Word (9) and Outlook (20) — made it into the top 50 apps on Android phones. The most installed game, you ask? Not surprisingly, Candy Crush Saga, which has held its position (more or less) since we started these reports way back in 2014. Kudos to the makers of such an addicting game. Examining more than 3 million Android users, we learned that the aging Samsung Galaxy S5 is the most used Android phone out there. Hot on its heels is the 2016 flagship Galaxy S7, which has been gaining market share and is on track to become the most used Android handset by early 2018. When reviewing phones overall, we also noticed something interesting: half of the Android phones turned out to be more than two years old, with some going back to 2012 with the S3. It seems that half of smartphone users keep their phones for more than two years for different reasons (price, lack of interest in newer models). If this is you, here’s what you need to know: Samsung does not regularly provide security updates for older models, as detailed in its quarterly list of updates. Eventually, these devices will become security risks to their users and should either be replaced with a newer phone or, at the very least, cleaned up and secured. Check out the full Avast Android App Report here.